I'm a huge fan of variety packs. I can't even remember the last time I bought a case of a single beer. BridgePort is now getting into the game with the release of their Beevana Brewers Box. It's a twelve-pack with 3 bottles each of BridgePort IPA, Hop Czar, Kingpin, and a seasonal selection (now Dark Rain). The full press release is below. What's your favorite variety pack? 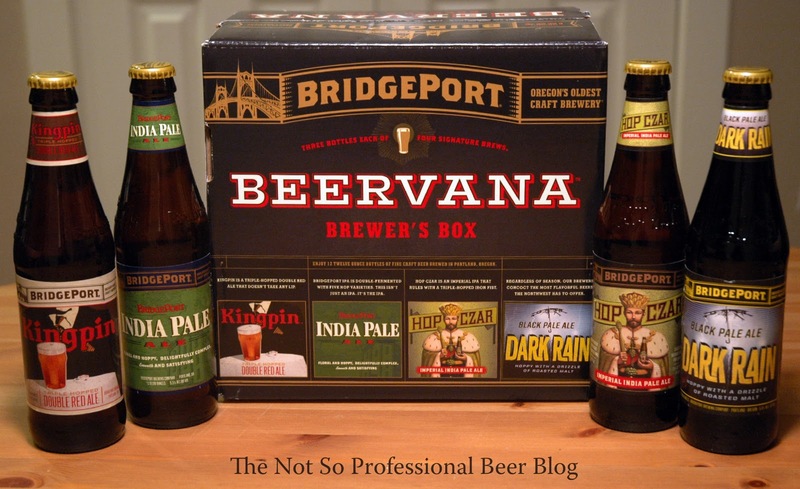 PORTLAND, Ore. – Dec. 5, 2011 – For the first time in its 27-year history, BridgePort Brewing Company will release a 12-bottle variety pack featuring four of its signature brews. The Beervana Brewer’s Box, will include BridgePort IPA, Hop Czar, Kingpin and a seasonal craft selection. • IPA: Our award-winning IPA is brewed with a blend of five hop varieties (Cascade, Golding, Ahtanum, Crystal and Chinook) and presents a floral, citrusy aroma and full hop flavor, while downplaying the bitterness. The beer pours smooth in the glass, emitting its signature golden glow. • Hop Czar: An Imperial India Pale Ale brewed with over two pounds of whole leaf hop cones in each barrel. The Emperor of IBU’s, Hop Czar is triple hopped with four varieties (Nugget, Chinook, Centennial and Cascade) to produce an aggressively bitter, yet drinkable flavor. • Kingpin: This triple-hopped red features rye and caramel malt yielding a deep red color. Kingpin uses a rarely-grown Willamette Valley Hop varietal known as Liberty Hops from fourth generation hop farmer John Annen of Annen Bros. Farm in Silverton, Oregon. • Winter Seasonal, Dark Rain: Black Wheat and Dark Crystal Malt add dense color and mild smooth flavors to this intensely hopped Black Ale. This ale has a very drinkable, mid-level alcohol and bitterness that starts with roasted and hoppy aromatic notes and finishes with the dry hop character of the Nugget hop varietal. A Chinook, Crystal, Centennial and Cascade blend is used in our hopjack to provide full flavored background hoppiness. Review: Black IPA, Alaskan Brewing Co.
Review: Dark Rain, Bridgeport Brewing Co.